I was feeling rather lazy this morning, but at the same time, wanted to prepare a smoothie that was somewhat different from my usual. Using my selection of Medicine Flower extracts, I created this fabulous Tropical Paradise. If you are looking to cut back on your intake of fruit or simply wish to expand your ability to create a fabulous mix of flavors, these are so much fun to work with. Warning: they are super concentrated, so you literally only need 1-2 drops per flavor. Because they are so concentrated, even when I use the "real" fruit, I will enhance the flavor of my food by adding the same flavor extract. For instance, my smoothie is made with a whole coconut, however, that coconut flavor gets lost with the added ingredients. 1 drop of the Medicine Flower Coconut extract will pop the coconut flavor immensely! 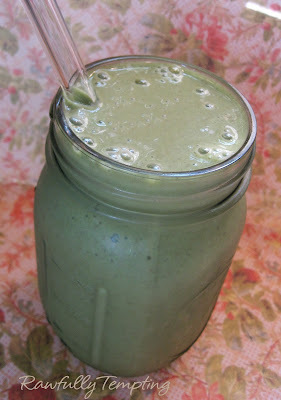 In a high speed blender, mix coconut meat, water and greens. Add additional filtered water as needed, so that you have enough liquid for two smoothies. Add remaining ingredients and blend until creamy. Garnish with shredded coconut or your favorite fruit and ENJOY! *Medicine Flower extracts can be purchased here or directly from Medicine Flower. If you purchase from Medicine Flower, be sure to mention Rawfully Tempting™ in the shipping comments...and MF will send a Special Bonus Sample with your purchase. Wow this looks really neat. I have not used a lot of the flower essence. Interesting. never tried flower essence before! !